Why are we increasing price on a year-old game? Because we underpriced it to begin with. Let me elaborate. The business of video games is weird. They're increasingly intangible, they often lose value over time due to aging technology, and they cost anywhere from $1 to $60. For a long time, I've said that I would buy any game that was $5 or less if I found it interesting. And you can get a lot of games at that price. 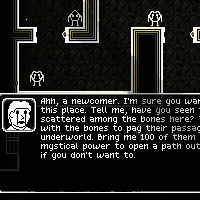 When we were picking a price for Ossuary, we were worried about how lo-fi and pixelly it was. We were worried about it being short: only a few hours. We were worried about it being nichey and wordy and weird. So we picked the price that we felt was a sure deal for anyone interested. 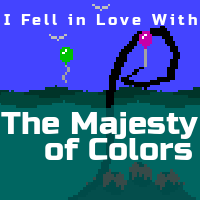 But we didn't really think about what the game was worth. At a recent meeting, we realized and wrote something down: "If a game we make is worth anything, it's worth $10." Now, there might be markets where that's not realistic. People expect mobile games to be barrel-scrapingly cheap. But in the PC space, $10 is a steal for a game with story and puzzles that leaves you thinking and feeling vaguely uneasy. Additionally, picking a price of $5 didn't translate into a lot of sales. Ossuary didn't get a whole lot of exposure and we think that the price may have actually hurt it. People coming across an unknown game with a stark and simple aesthetic may have seen the cheap price tag and assumed the game wasn't worth more than that. But Ossuary is worth more than that. We've increased the price to $10 and we'll keep it there for now. This is the price it should have been all along.